the ethics of the body and commodification: the human organ trade, and factory farming of animals. 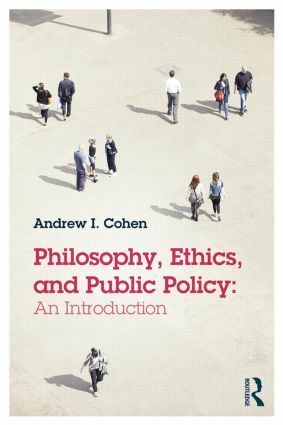 Each chapter illustrates how ethics offers ways of prioritizing some policy alternatives and imagining new ones. Reflecting on various themes in globalization, markets, and privacy, the chapters are windows to enduring significant debates about what states may do to shape our behavior. Overall, the book will help readers understand how ethics can frame policymaking, while also suggesting that sometimes the best policy is no policy. Including annotated further reading, this is an excellent introduction to a fast-growing subject for students in Philosophy, Public Policy, and related disciplines. Andrew I. Cohen is Director of the Jean Beer Blumenfeld Center for Ethics and Associate Professor of Philosophy at Georgia State University, USA. He is co-editor (with Christopher Heath Wellman) of Contemporary Debates in Applied Ethics (second edition, 2014).